Author(s): Parminderjit Kaur, Ankit Rampal, Preet M. Singh Bedi, Neena Bedi. Department of Pharmaceutical Sciences, Guru Nanak Dev University, Amritsar-143005, India. Rifaximin is a rifamycin derivative, having extremely poor aqueous solubility. The objective of present study was to improve dissolution and solubility of drug using β-cyclodextrin inclusion complexes and also to evaluate the effect of presence of sodium deoxycholate on solubilization efficiency of β-cyclodextrin. The stochiometry of inclusion complexes of binary (drug-cyclodextrin) and ternary system (drug-cyclodextrin-sodium deoxycholate) were determined by phase solubility studies at 25°C. The stability constants (K1:2) calculated from phase solubility analysis were 126M-1 and 267M-1 for binary and ternary systems respectively. 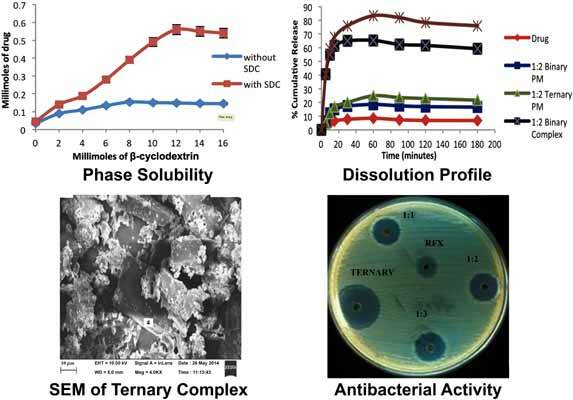 The inclusion complexes were prepared by solvent evaporation method with the inclusion efficiency of 43% and 56.9% for binary and ternary systems followed by their characterization using fourier transform infrared spectroscopy, X-ray diffractometry, differential scanning calorimetry and in-vitro antibacterial activity. The solubility of drug was improved by 4.3 and 11.9 folds in binary and ternary inclusion complexes, respectively. Therefore, it can be concluded that the ternary inclusion complexation having better solubilization efficiency as compared to binary complexation. Keywords: β-cyclodextrin, FTIR, phase solubility, Rifaximin, ternary inclusion complexes, X-RD, antibacterial. Affiliation:Department of Pharmaceutical Sciences, Guru Nanak Dev University, Amritsar-143005, India. Keywords:β-cyclodextrin, FTIR, phase solubility, Rifaximin, ternary inclusion complexes, X-RD, antibacterial. Abstract:Rifaximin is a rifamycin derivative, having extremely poor aqueous solubility. The objective of present study was to improve dissolution and solubility of drug using β-cyclodextrin inclusion complexes and also to evaluate the effect of presence of sodium deoxycholate on solubilization efficiency of β-cyclodextrin. The stochiometry of inclusion complexes of binary (drug-cyclodextrin) and ternary system (drug-cyclodextrin-sodium deoxycholate) were determined by phase solubility studies at 25°C. The stability constants (K1:2) calculated from phase solubility analysis were 126M-1 and 267M-1 for binary and ternary systems respectively. The inclusion complexes were prepared by solvent evaporation method with the inclusion efficiency of 43% and 56.9% for binary and ternary systems followed by their characterization using fourier transform infrared spectroscopy, X-ray diffractometry, differential scanning calorimetry and in-vitro antibacterial activity. The solubility of drug was improved by 4.3 and 11.9 folds in binary and ternary inclusion complexes, respectively. Therefore, it can be concluded that the ternary inclusion complexation having better solubilization efficiency as compared to binary complexation.